The enormous teddy bear attracted attention almost immediately after it was set up at the corner of James and King streets in St. Catharines, Monday morning. It was the impact the volunteers from the Ontario Health Coalition were counting on. “You need a good prop,” said Sue Hotte, who heads up the Niagara chapter of the provincial organization. While the bear drew the attention of passersby, it gave the five coalition volunteers an opportunity to talk to them about a far more serious concern — the future of public health care which is facing increasing pressure from private-sector interests. The stop in St. Catharines coincided with the official release of an Ontario Health Coalition report that says at least 88 private medical clinics in six provinces across Canada have been charging patients extra user fees and selling necessary medical services. “The main message is there are a lot of private clinics that provide services that are billed to OHIP in Ontario. What we’re finding is a lot of these clinics, owned by doctors are charging for access, saying, ‘It’ll take you a few months to get into the public system, but I have a private clinic over here,’” said coalition volunteer Peter Boyle. Patients, for instance, may need to wait for a year before cataract surgeries can be done in some areas, but “there’s a lot of private clinics where you can get it a lot quicker if you open up your wallet,” he said. He said Canada’s health minister, Jane Philpott, has vowed to work with the provincial governments to crack down on physicians who are charging patients for medical services while also billing public health care. Boyle and fellow volunteer Don Arkell are bringing the bear to 20 locations throughout the province in the weeks to come, including a stop that took place in Fort Erie on Monday afternoon. 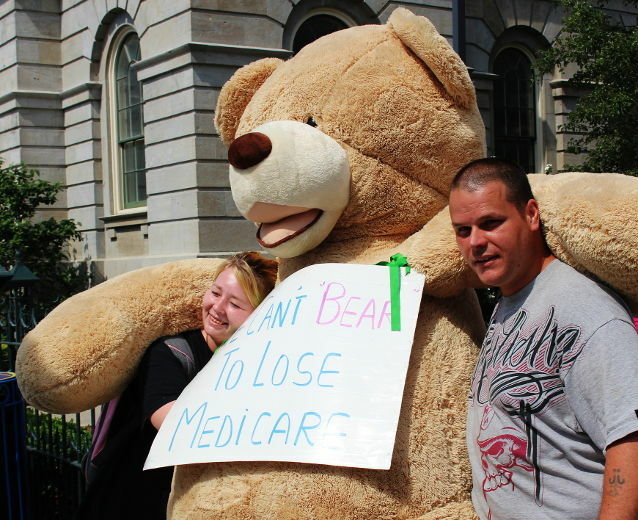 “There have been a lot of people hugging this bear, and a lot of people caring about medicare and health care,” Boyle said. Boyle said the event also gave the volunteers an opportunity to point out that while people across the country celebrate Canada’s 150th anniversary on July 1, it is also the 49th anniversary of the Canada Health Act. The coalition has previously used over-sized props to draw attention to its concerns, including a huge rocking chair used during a campaign concerning long-term care services. Hotte said she hopes to seat the giant bear on that giant rocking chair and enter it in the Welland Rose Festival Grande Parade on June 25, as part of the group’s efforts to save Welland hospital, threatened with closure as part of a plan to build a new hospital in Niagara Falls.